I often use OCR to convert pdf documents into text files for translation. 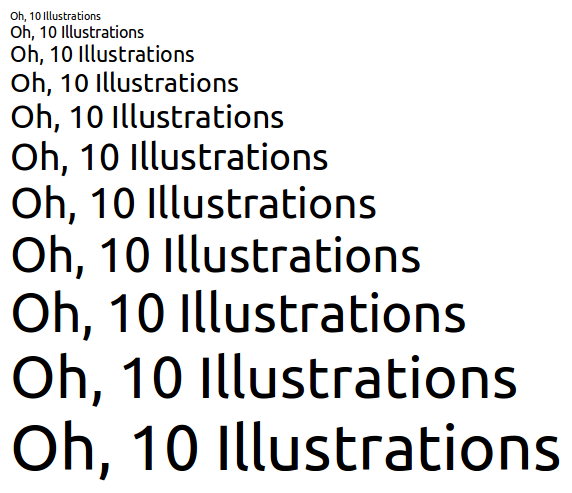 Fonts poorly designed for OCR processing will for example show systematic mismatches for "1", "l", "I", "i", "j". A quick glance at Ubuntu font shows that it should be reasonably OCR-proof, except for the lower-case "l" that looks quite similar to an upper-case "i", and the upper-case "o" looking much like a zero. Maybe Ubuntu font could take a daring stance and be_very_OCR proof. This would make it a resolutely modern font, with a technical incentive for wide adoption: it would just work better on computers. Frere: the stylistic direction for the direction of the Ubuntu Font Family has been mostly set, but there have been some recent changes to the design of glyphs (bug #623925, bug #621157). Thank you for looking at the current fonts and giving an estimation. It would be very useful if you could undertake some of the research on the *real* impact of OCRing, so that it can be kept in mind as the design of future glyphs comes up. Could you try doing OCR in the same real-world setting that you currently use, and posting the results you have with the types of texts that you encounter. Here are some suggestions I made to Mark. * Definitely rework upper-case "I", which looks like a simple vertical bar and can be mistaken for a bunch of other characters. * Clearly differentiate both top and bottom parts of number "1" and letter "l". The actual Ubuntu Font should score an average here. * Add a (thin) horizontal bar in the middle of number seven "7". * Add a dot inside the zero "0" in order to distinguish it from upper-case "O". Another main source of OCR mismatches and easy to fix. "o", that could remind the handwritten letter. I took a standard text (the first chapter of Genesis), made a second version in all upper-case, and started systematically swapping the above mentioned characters, transforming both texts in human-readable gibberish. The idea is to then print to pdf, convert to low resolution jpg or png, and process with state-of-the-art OCR software (I am using FineReader in WinXP on Virtual Box). The more mismatches we get, the better. I would also like to test a technical document containing plenty of numbers and codes, which are tricky for OCRing. Unfortunately, I am extremely busy professionally and had no time to finalize this properly. I will keep you informed. Ideally, people working on OCR software should be consulted. Facing these problems is what they spend their time doing. They will possibly be delighted to point at problems and solutions for Ubuntu Font. You could try contacting the good people at GOCR, Ocropus and Tesseract. I guess OCR read-back is something that we could automate and run as part of a test-suite to get hard numbers out of, I don't know to what degree it will be possible to go back and redraw the core Latin set, but it would be interesting to graph the outputs numerical. It's one of the few things that with a font it would be possible to test pragmatically and provide some level of regression feedback. I don't know how much need there will be for paper-OCRing, but I think OCR might have a use in eg. automatically OCRing and indexing screenshots in Launchpad. For instance, just yesterday somebody pasted an strace/stacktrace of a program as a bitmap screenshot. We have some OCR software in Ubuntu called "Cuneiform" which (according in the documentation) supports "English, German, French, Spanish, Italian, Portuguese, Dutch, Russian, Mixed Russian-English, Ukrainian, Danish, Swedish, Finnish, Serbian, Croatian, Polish and others". the purposes of different fonts and different types of writing. software to do what a human would do - and recognize it as "alliance". the monospace font is delivered. frere: re: 'Add a dot inside the zero "0" in order to distinguish it from upper-case "O".' Thank you for the suggestion; this has been added to the Ubuntu Mono beta; for pure-OCR work Ubuntu Mono is likely to be much more suitable I would have throught. I've started experimenting with printing address labels in Ubuntu Mono and think they look wonderful! If you wanted to do some further OCR testing (so we could at least document what works and what doesn't) then the mono is probably the place to do it. OCR is, I think, a relatively minor reason to ensure distinctiveness of characters. More important is to make typos easy to find (for example, when typing URLs, code, or temporarily-revealed passwords), and to make phishing harder. The Ubuntu font does extremely well at this without being distracting or ugly. The capital O is about 40% wider than the numeral 0; and the 1 (thanks to its hook), lower-case l (thanks to its tail), and capital I (thanks to its height) are highly distinct. As David mentioned, going further than that could easily be distracting (for example, a dot in the 0 or a crossbar on the 7) or ugly (for example, a serif capital I in an otherwise-sans-serif font). Those would detract from Ubuntu's primary use as a beautiful UI font, and make much more sense in Ubuntu Mono. Since there isn't a specific problem mentioned here, I'm marking this Incomplete. Please reopen if you identify a specific reproducible problem.